A new technique of manufacturing ceramics has been developed by material scientists at ETH Zurich. With this technique, starting materials no longer have to be fired. Instead, using high pressure at room temperature, they are compacted in a considerably more energy-efficient process. The manufacture of bricks, cement, porcelain crockery, and bathroom tiles usually requires a huge amount of heat: a kiln is used to fire the ceramic materials at temperatures as high as 1,000 °C. Now, what the ETH Zurich researchers have developed seems to be an amazingly simple manufacturing technique that works at room temperature. The researchers used calcium carbonate nanopowder as the starting material, and instead of firing it, they added a small quantity of water and then compacted it. The manufacturing process is based on the geological process of rock formation. Sediments that are compressed over millions of years through the pressure exerted by deposits lying over it form sedimentary rock. This process converts calcium carbonate sediment into limestone with the aid of the surrounding water. As the ETH researchers used calcium carbonate with a highly fine particle size (nanoparticles) as the starting material, their compacting process took just one hour. 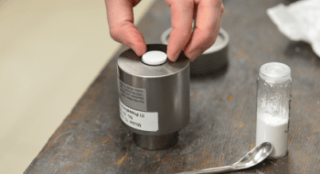 Our work is the first evidence that a piece of ceramic material can be manufactured at room temperature in such a short amount of time and with relatively low pressures. Based on tests, the new material can endure nearly ten times as much force as concrete before it breaks, and is as rigid as concrete or stone. In other words, it cannot be easily deformed. Up to now, the team has developed material samples of approximately the size of a one-franc piece using a conventional hydraulic press such as those usually employed in industry. The challenge is to generate a sufficiently high pressure for the compacting process. Larger workpieces require a correspondingly greater force. According to the researchers, ceramic pieces measuring about the size of small bathroom tiles should tentatively be viable. For a long time, material scientists have been searching for a way to produce ceramic materials under mild conditions, as the firing process requires a large amount of energy. Report on Energy Efficiency Homes in the U.S. The new room-temperature technique – which experts call cold sintering – is much more energy-efficient and also enables the production of composite materials containing, for instance, plastic. The method is also interesting for a view to a future CO2-neutral society. Particularly, the carbonate nanoparticles could feasibly be produced using CO2 captured from waste gases from thermal power stations or from the atmosphere. In this set-up, the captured CO2 is allowed to react with a suitable rock in powder form to create carbonate, which could then be used to produce ceramics at room temperature. The climate-damaging CO2 would therefore be stored in ceramic products for a prolonged period. These would constitute a CO2 sink and could help thermal power stations to function on a carbon-neutral basis. According to the researchers, in the long term, the new technique of cold sintering even has the potential to lead to more environmentally friendly alternatives for cement-based materials. However, immense research efforts are required to attain this goal. Cement manufacture is not only energy-intensive, but it also produces large quantities of CO2 – unlike prospective cold-sintered replacement materials.